It was on the second morning of our road trip to Portorož, a sunlit beach town on the Adriatic coast of Slovenia, that the word burek was first uttered by my my sister-in-law in the context of local breakfast specialties. My brother, who studied abroad in Ljubljana in his college years and was perhaps too well acquainted with the dish winced at the memory. He’s not a fan. I, on the other hand, could not let it go. Just as my 2 year old niece lights up every time pizza or ice cream are brought up, I rubbernecked at every pekarna we drove by hoping that someone would be hungry enough to suggested splitting one. Pekarnas are bakeries, which are almost as prevalent in Slovene towns as are coffee shops or ice cream stands, and that’s saying a lot. A few things in there I recognized right away. 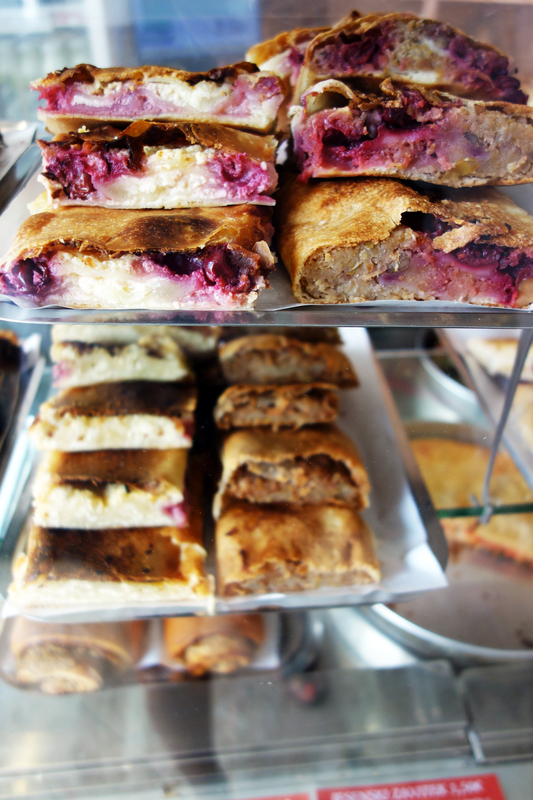 There are many different types of zavitek (known in Hungarian as rétes and pretty much everywhere else in the world as “strudel”). There’s a vanilla custard and whipped cream cake called kremna rezina which is also very popular in Hungary under the name krémes. Fillings are those ubiquitous to Central Europe. There’s tart apple, sweet quark cheese, sour cherry, ground walnut, poppy seed and apricot jam. Pekarna Center, near the Portorož Marina, also had savory zavitek with spinach and quark or chicken. I think I even saw one with tofu and carrots. But I came for one thing only and, not surprisingly, I found it at Pekarna Center. 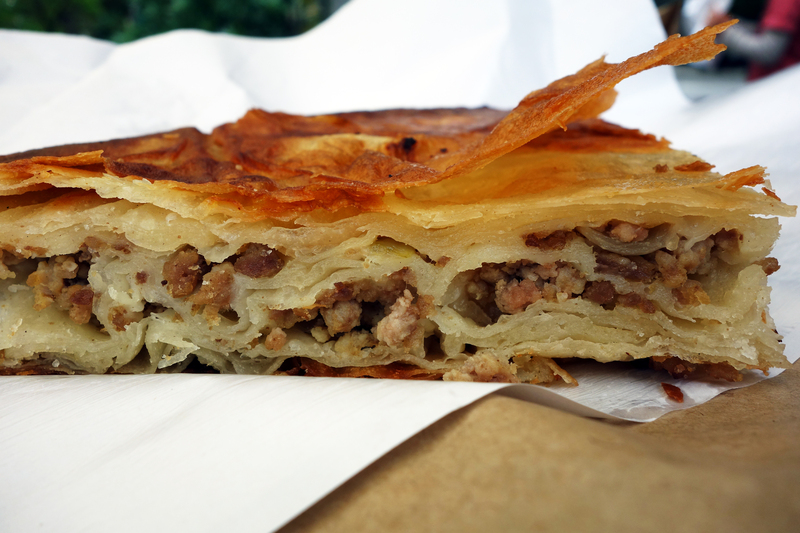 Burek is a baked pastry made with layers of phyllo dough and a variety of fillings. It was first develop under the name börek on the Anatolian Peninsula by the Ottoman Turks and was from there quickly spread to areas which fell under the rule of the Ottoman Empire. This explains why the pastry pops up all over Southern Europe and North Africa as well as modern day Turkey. It’s popular in Amernia as byorek, in Greece as boureki, in Bulgaria as byurek. In Tunisia börek became brik, and is made with malsouqa (a layered pastry dough similar to phyllo) and filled with egg. In former Yugoslavia burek is also very popular and is eaten at any time of the day as fast food or in the morning as breakfast with yoghurt. It’s perhaps most prevalent in Bosnia, where the pastry is rolled into a spiral and sliced for serving. 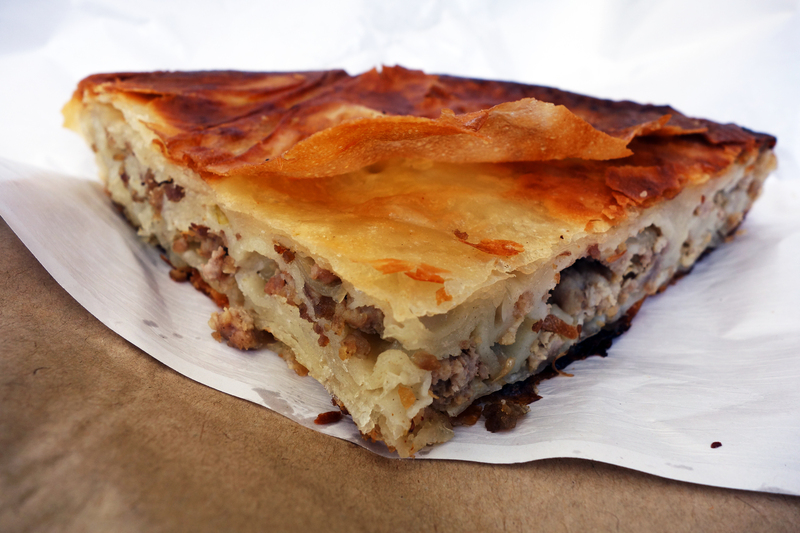 It’s also ubiquitous in Serbia, Croatia, Macedonia and Slovenia where it is layered into a circular pan and baked. The latter is the type I tried. 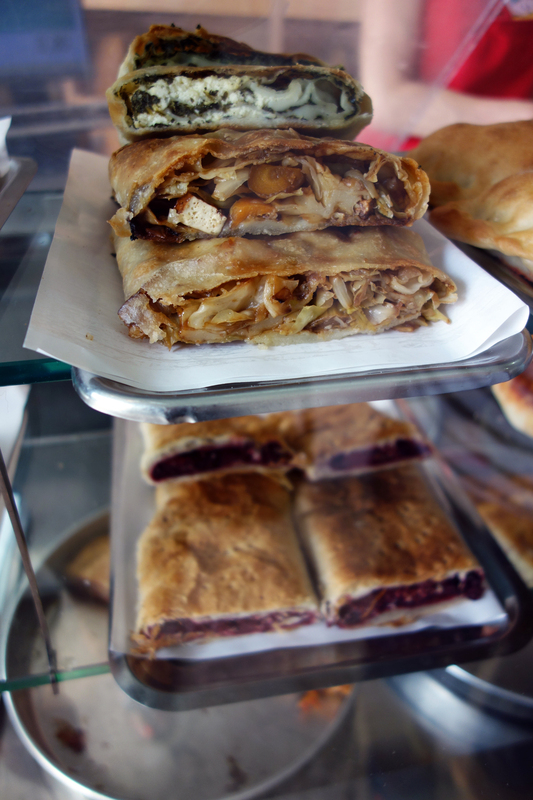 The round variant of burek was originally developed in the Serbian town of Niš, where it was introduced almost 500 years ago by a famous Turkish baker from Istanbul. The town still commemorates the birth of the dish with an annual burek baking competition called Buregdžijada. In 2005 a local competitor produced a 220 lb burek, which is thought to be the largest burek ever made. 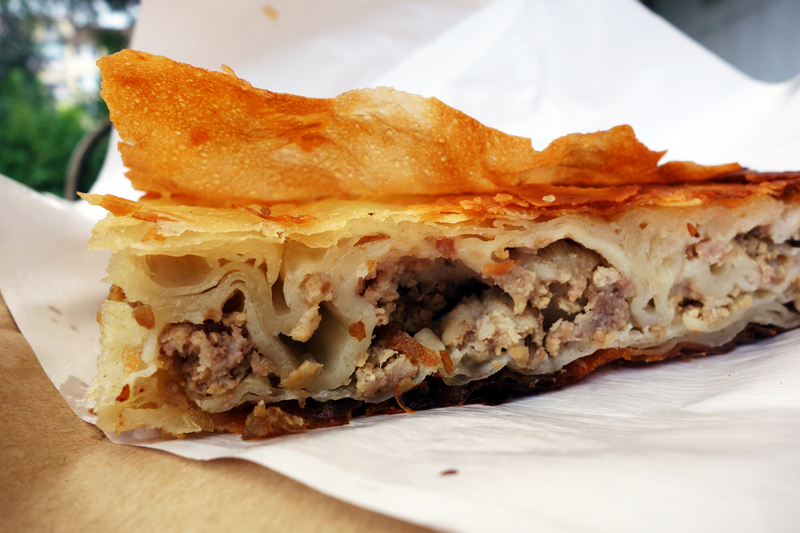 Every proper Slovene pekarna necessarily has burek in at least two varieties: savory quark cheese (Sirov Burek) and stewed minced pork (Mesni Burek). 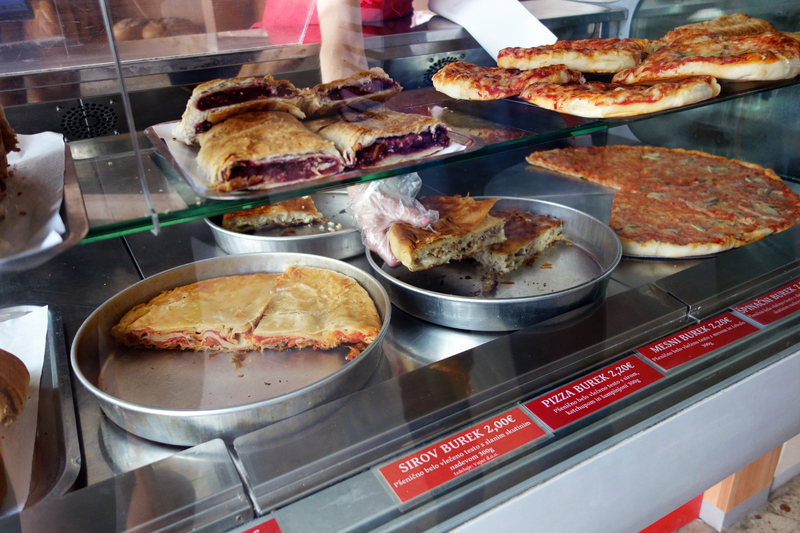 Other popular flavors include Pizza Burek (with cheese, ketchup and mushrooms), Spinach and Cheese or Mushroom. Some places even make sweet ones with apple or sour cherry. It’s not the lightest of breakfast options. I had what was perhaps a third of one portion at around 11 o’clock in the morning and it lasted me through the day. Yet I’ve witnessed many a burly Slovene consume the entire slice for breakfast with coffee only to dive deftly off the pier for a quick dip in the Adriatic. A slice is one fourth of a 8” pie, the size of a standard pizza. But it’s also more than an inch thick and, as my brother not so delicately declared, swimming in grease. I imagine it’s a godsend when you’re drunk or hungover. Biting into one is pure fat kid comfort. A crunchy top layer gives way to tender folds of moist dough and crumbles of pork seasoned with slivers of caramelized onion, a bit like a sauceless meat lasagna sandwiched between golden brown sheets of phyllo. Each bite is mushy and warm and soft, requiring very little effort to actually chew and swallow. While the texture satisfies and the density of the thing appeases any appetite, the flavor isn’t too exciting. The meat is minimally seasoned ground pork that lacks black pepper or anything red to spice it up. And while the natural sweetness of the onion does add a nice touch, it doesn’t save the slice from blandness. Nothing a good squeeze of hot sauce can’t fix though.